The Gas Ex 98 cruise was conducted in the North Atlantic and Northeast Pacific Oceans between May 7, 1998, and July 27, 1998. The cruise departed from Miami, Florida, and ended in Newport, Oregon, with port stops in Lisbon, Portugal; Ponta Delgada, Azores; and Miami, Florida. 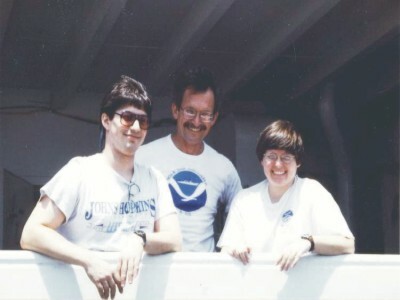 The primary focus of the cruise was a 1-month process study in which an open-ocean air-sea exchange experiment was conducted within a cold-core eddy. The final leg was a transit run through primarily coastal waters from Miami to Newport via the Caribbean Sea and Panama Canal. During this field campaign, we crossed oceanic regions that had been sampled on previous cruises at different times of year. Methyl bromide supersaturations in temperate open-ocean waters of the northeastern Atlantic Ocean provided evidence for seasonality in the saturation state of this region. In contrast, tropical waters were generally undersaturated with respect to methyl bromide in both the Atlantic and Pacific Oceans. 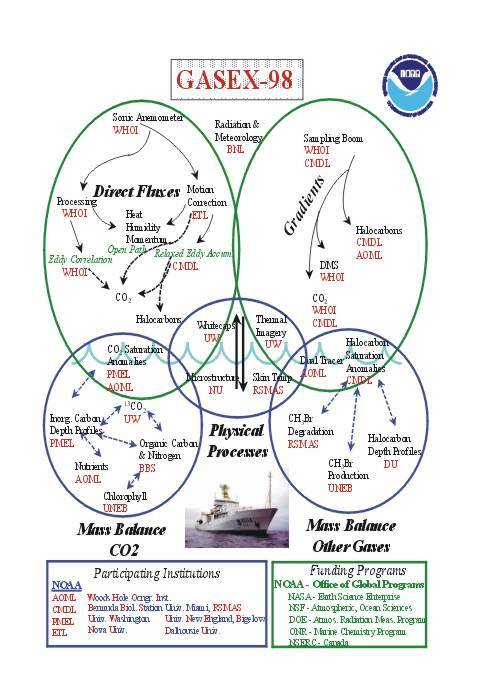 Data combined from this and the three BLAST cruises support a relationship between sea surface temperature and methyl bromide air-sea flux. While this relationship can account for a large fraction of the variability in methyl bromide globally, it cannot accurately reproduce the seasonal cycle observed in temperate waters. Results for methyl bromide from this cruise were published in 2000 (see publications list). From left to right: Dan, Jim, and Shari in Miami, prior to the cruise. 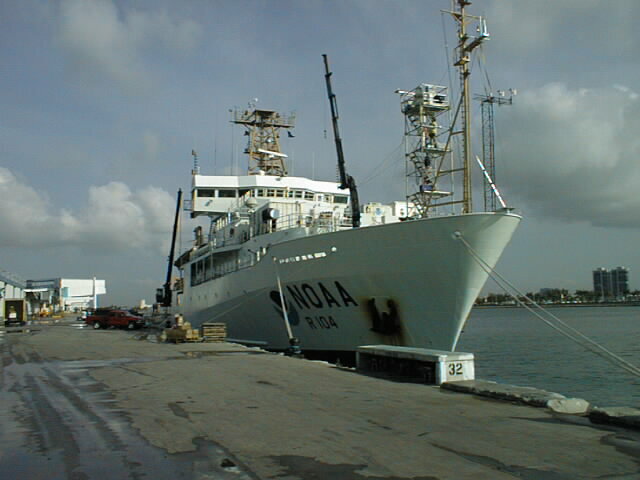 The NOAA Ship Ronald H. Brown in port in Miami, Florida. 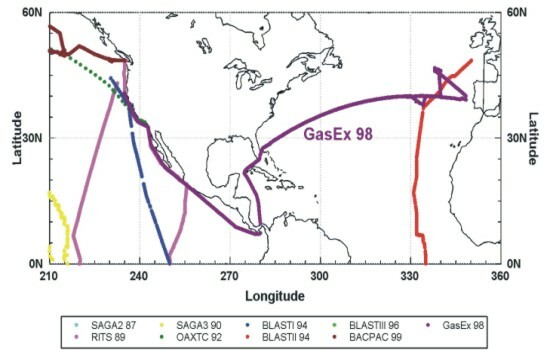 GasEx 98 is shown in the dark purple in the North Atlantic and Northeast Pacific, out of Miami, Florida and back in to Miami before continuing on to Newport, Oregon. General position and meteorological data as well as methyl bromide data are available from our public FTP site at ftp.cmdl.noaa.gov, subdir /hats/ocean/gasex_98.